Wing span: 1 5/8 - 2 1/2 inches (4.2 - 6.3 cm). Identification: Forewing tip squared-off. 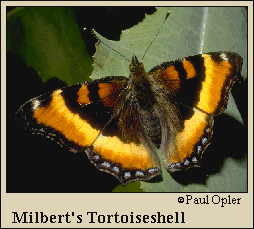 Upperside is black with a wide orange submarginal band which grades to yellow at the inner edge of band. Narrow black marginal border on both wings; the hindwing border may contain some blue spots. Life history: In the afternoon, males perch on hillsides, banks of gulches, logs, or behind bushes to watch for females. Eggs are laid in large batches of up to 900 on the underside of host plant leaves. Young caterpillars feed together in a web, while older ones feed alone and make shelters of folded leaves tied with silk. Adults hibernate, sometimes in small groups. Caterpillar hosts: Nettles (Urtica dioica and U. procera). Adult food: Usually flowers, such as thistles, goldenrods, and lilacs; probably also sap and rotting fruit. Habitat: Wet areas near woodlands, moist pastures, marshes. Range: Boreal North America south of the taiga. Southern Alaska south to California, Nevada, and New Mexico; east to Newfoundland and West Virginia.